The fabric on the left will be the dress, the one on the right--bloomers. This is the kind of thing that makes me cross my fingers and toes for a little girl! SO cute! how darling...just 'for'? looks like Easter to me! That will be very cute! Love that floral fabric - it's the mix of the sweet pink and earthier, "duller" greens that makes it awesome! SUPER cute. Love the fabric choice - you have a wonderful eye for color. I think this project will be so very cute...I enjoyed meeting you on Saturday at the Guild meeting. Your quilts were so very beautiful. 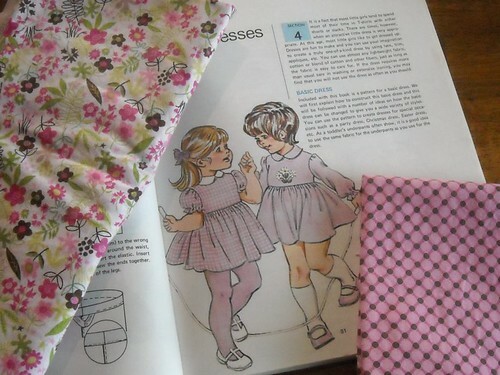 Very sweet, I love the idea of little girls dressed feminine again! Ooooo that's gonna look so cute! I LOVE that fabric! What a cute little dress that will make! So, so cute!! Perfect fabric choices too!